But in the end, I still really needed more long sleeved tops and I already had the fabric and the overlocker and coverstitch were still threaded in the right colours. So it’s fate. 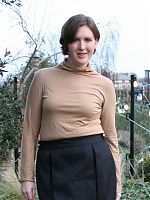 At first I thought this colour was mustard, then cappuccino, and then I realised it’s definitely caramel – I made this top a few Saturdays ago, and I wore it out to what was supposed to be our friends Caramel and Simon’s tenth anniversary party that night. But the snow was coming down so hard that we only got halfway to theirs and had to turn back, but I thought it was too lovely a top, colour, and coincidence to pass up. Though now I feel all Mulberry for naming my top after a lady! 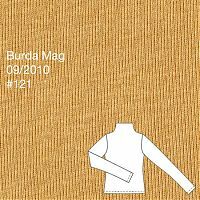 Rather than use the the excessively long sleeves on this pattern, I instead swapped in the sleeve pattern from my old, faithful sweatshirt because I knew the fit was good and Burda tend to keep all their knit sleeves drafted pretty similarly. Even so, 1.5 yards ended up to be not quite enough fabric to fit everything in – I had to cut the sleeves on the crossgrain so I used 1” seam allowances down the length of the sleeve to account for the lesser stretch in the fabric. If there’s anyone out here who haven’t made this yet (!) here’s a handy tip – when you’re cutting out your pieces, make sure you somehow mark the back, either by sewing on a label right away, or making a snip in the centre back neckline or something because once you sew it up, it’s impossible to tell which way round it goes! I also find that it’s a bit difficult to squeeze this over my fat head, but I also have to hold the neck open with my hands as I put it on so I don’t get my head caught in the folded neck pieces inside (like stepping into a hem on trousers). But once it’s on, the fit is great! I’ve noticed on my first wearings that one of the sleeve seams twists around to my pointer finger or so, which means my right sleeve must’ve been cut slightly off-grain. Not that I’m really that bothered in what’s essentially a teeshirt, but I do finding it interesting in a geeky pattern drafting way. Oh, and I thought I’d finish off one of the many pairs of pant(ie)s I prepped last week, so what better than to make the ones that match this top? I just love dipping into my lingerie elastics drawer to find bits of fun elastic and lace! I’ve used three difference kinds of cream elastic here – the frilly elastic was a gift from Sigrid years ago, and the picot leg elastic and the more fancy waistband elastic were both bought from The Sewing Chest. * Yes, I can hear your thoughts. Separator image Posted in Gallery and tagged with bamboo, bwof, knit, lingerie, top.